Will Apple Approve Opera Mini for the iPhone? Why Is Opera Mini on iPhone So Fast? Apple Placing Ban on Jailbroken Devices? "Of course, the Mac was derided as a toy and not a tool for serious work. While the Mac's market share stayed small for years, the impact of its revolutionary interface was felt throughout the world - because every subsequent personal computer operating system followed the Mac's example. "Twenty-six years later, we're still interacting with our computers in fundamentally the same way . . . compare your Mac running Snow Leopard today with an original Macintosh running the first version of the Mac OS and the similarities largely outweigh the differences. "But as good as the Mac is, Apple realised that it wasn't good enough...."
"But I don't think the iPad heralds the death of the personal computer . . . This is the next phase of computing...."
"Apple's new iPad is being criticized for lacking the capacity to run multiple third party applications at once, but the company has a variety of options to pursue in addressing the issue. "The iPad's iPhone OS arbitrarily limits third party apps from running in the background after the user closes the app. But this isn't because the iPhone OS 'can't multitask,' as the iPhone OS uses the same preemptively multitasking Mach/BSD kernel as Apple's desktop Mac OS X." "With Opera Software's announcement that the company is this week demonstrating an iPhone-app version of its eponymous Web browser, we've seen quite a bit of commentary about the app being dead in the water, along with some legitimate speculation as to whether or not Apple will approve a third-party Web browser. (The company hasn't yet submitted Opera Mini to Apple for approval, although our colleagues at Macworld UK got a look at it earlier today.)" Link: Opera Mini for iPhone: Will Apple Approve It? "Opera has claimed that its browser for the iPhone runs six times faster than the handset's native Safari browser over 3G. "The company has been demonstrating Opera Mini on a developer iPhone at Mobile World Congress. As Apple does not currently accept rival browsers onto the platform, Opera has not yet submitted theirs to the App Store - but it intends to do so at some point, founder Jon von Tetzchner told ZDNet UK during a demonstration." "We came, we saw, and we're still scratching our heads over what Opera is up to with its Mobile World Congress demonstration of its Opera Mini browser running on the iPhone 3GS. But before we get into that, let's talk performance: it's fast. Opera Mini is very, very fast on the iPhone. Loading the New York Times, for example, was about 5x faster than loading the same page in the iPhone 3GS' stock browser...."
Link: Opera Mini on iPhone Is Fast, But Why? "Opera Software has never been one to shy away from publicity. And now that the company has to somehow convince Apple to approve its new Opera Mini iPhone application, we'll likely see many more stunts like this one: Opera hired these two ladies to greet attendees after they arrived at the airport for the Mobile World Congress. "It's another clever ploy to grab Apple's attention - the first being that Opera knowingly developed an iPhone application that went against Apple's rules, and then held a demo of the forbidden app at the MWC...."
"Just a short note to point out that Apple's iPad seems set for a future in the enterprise, judging at least from the frenetic level of Tweeting activity greeting a report dating from last week as published by CIO. "That report features a chat with Computer Industry Hall of Fame inductee, Rosenthal, Chairman and CEO of Enterprise Mobile, and he thinks the iPad is going to be a 'game changer' for business users - and he thinks the device is going to impact on business in a big way, fast." "Could this be the iPad's 'killer app'? "Microsoft has revealed to T3 that it may be ready to unleash a version of Office for Mac for the Apple iPad. "The Seattle-based company let slip the possibility of a suite for the new tablet during a demonstration of the brand new Office for Mac 2011, which is scheduled for release in late 2010." eWeek's Don Reisinger says that while Apple has been touting the iPad tablet as "revolutionary" since it launched the device on 28 January, a closer inspection reveals a variety of omissions, shortcomings, and if we're honest some major flaws that the company would just as rather we not know or think about. "The iPad has fewer capabilities than a netbook, in a similar size. Not a good start. "People about to buy a computer tend to fixate on speeds and feeds - megahertz, megabytes, megapixels. After watching Steve Jobs talk about his iPad . . . I had the notion that a better way to approach a new gadget is to ask three questions: How much do you have to think about the decision to carry it with you? How long does it take to turn on? How do you tell it what you want it to do? "Remember these, and you have the only computer advice you will ever need. I can use them to explain my initial, somewhat lukewarm, reaction to the iPad." "Arguably the most notable iPad technology is the chip that powers it, the new A4. The iPad's 1 GHz system-on-a-chip, clocked at 1 GHz (compared to about 600 MHz for the iPhone 3GS) was designed by Apple itself, through its acquisition of chipmaker PA Semiconductor. The processor's speed, along with the advanced power-management that allows Apple to brag that the iPad will be able to play 10 hours of continuous HD video without recharging, could be a significant selling point for the new device as it establishes its space in the marketplace. "The A4, as a system-on-a-chip (SoC), combines the CPU, graphics processor, memory management and other components such as the I/O controller on a single piece of silicon. Though Apple has not released detailed specs on the chip, observers have gathered details out of reports from suppliers, leaks and a healthy dose of conjecture...."
"According to a report, Apple has begun banning users with a hacked iPhone from its App Store. Sherif Hashim, an iPhone hacker who is credited with finding an exploit in the latest iPhone software, recently posted a message on Twitter explaining that his Apple ID had been banned for 'security reasons.'" Link: Apple Placing Ban on Jailbroken Devices? "For a long time the connector dock of the iPhone and iPod touch was only useful for recharging, synchronization and to connect loudspeakers to it. For some time Apple has progressively opened this dock. One knows of the additional GPS installed in the TomTom support and now there are some things useful to everyone. "An SD connector will soon be available. Supported by an application available on the AppStore, it will make it possible to manage the contents of the card and to make transfers of data. Other adapters are in the course of production, and they open prospects difficult to evaluate quickly." PR: V 2.0 includes a premium upgrade for $1.99. What's in the Premium Upgrade? Push Notifications - Breaking news and Medals straight from the Games. Medals and Results - In-depth medal breakdowns and results data on every event of the Games. Even follow event results while they are in progress. Dedicated Hockey section with the most in-depth results data available, including detailed box scores, player stats and play-by-play. Live Blogs - Get in the game with live blogging of the biggest events, such as Hockey, Curling and Figure Skating. Our panel of experts will join the interactive conversations throughout the Games. It's everything you will need on the Games from Canada's official broadcasters: CTV, TSN, Rogers Sportsnet, RDS, V, RIS Info Sports, OLN, OMNI, APTN, and ATN. Includes "MGTwitterEngine" code by Matt Gemmell. 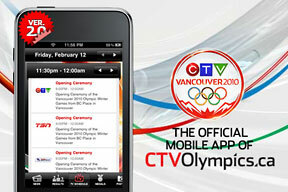 The CTVOlympics.ca iPhone App is designed and developed by Indusblue inc.
"There have been some other utilities that turn your iPhone/iPod touch into a flash drive, but this one is free and very easy to use. It's called iPhone Explorer. You install the app on your Mac, or your PC (there's an app for each platform) and you're ready to go. You'll see your iPhone appear when it's plugged into your computer. You can view the folder structure, and drag and drop items to or from the iPhone to your desktop or back the other way." PR: Thinklabs announces Stethoscope App for Apple iPhone and iPod touch, a medical application that works with Thinklabs' patented, performance leading, ds32a Digital Stethoscope. 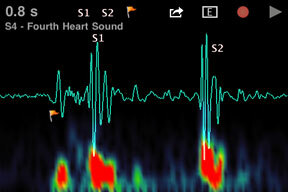 Stethoscope App provides real time visual display of patient heart and lung sounds. Physicians, nurses, students, EMT's and others now have a complete mobile auscultation tool for capturing, displaying, editing, saving and emailing stethoscope sounds such as heart sounds, bruits, lung sounds and bowel sounds. All this can be done right on the iPhone or iPod touch - at the bedside, in the office, or at a remote location. Telemedicine or remote users, to send sound and image files directly from their iPhone or Touch to multiple recipients. When capturing heart sounds, the phonocardiogram waveform is displayed along with the spectrogram, which highlights the pitch and frequency characteristics of the sound. Recordings can be edited, saved and emailed on the iPhone/Touch. Emails are automatically formatted with attached .wav files and waveform images. Thinklabs' free Phonocardiography software can then be used on Mac or PC for further signal processing, display or listening. Special features are also provided for educators, residents and medical students, with a library of heart sounds built into the App as Reference Sounds. Clive Smith, CEO of Thinklabs elaborated on this feature, "Going forward, we will expand on the educational content by providing new sounds along with educational materials. This is just the beginning, as we provide upgrades of content and features in the future to our user community." Smith described his company's approach to the App, "We have a large stethoscope user base that communicates closely with us about their needs and wants. I have personally spoken to over 25,000 physicians and nurses over the last few years. That's quite a focus group! Based on their feedback, I believe that we are giving them a tool that takes the stethoscope to a new level of utility." Leading software designer, Tom Andersen, who has vast experience utilizing Apple's graphics and user interface capability to create sophisticated scientific software usable by all audiences, developed the software. Clive Smith explains further, "Tom has developed an App that displays complex data with great clarity, and provides rich features with extraordinary simplicity. A doctor can Record, Display, Edit, and Email a heart sound in about 30 seconds. That's an incredible feat for software design, and a reflection of how well Stethoscope App uses the fantastic iPhone user interface. There is a real challenge today to create superior clinical tools while simplifying the workflow. Stethoscope App is amazingly simple to use, despite its powerful feature set." 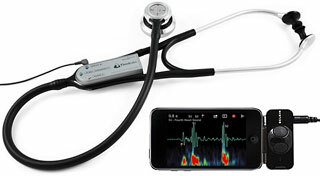 Thinklabs is the first company to provide an electronic stethoscope with recording and display of heart and lung sounds on the Apple iPhone and iPod touch. Thinklabs ds32a Digital Stethoscope uses a patented acoustic sensor, which set a new standard for stethoscope audio performance. This has earned the ds32a accolades in both the clinical world and in broadcasting, where it is used for capturing heart sounds, from medical talk shows to the Superbowl. Stethoscope App continues Thinklabs record of being first to market with medical innovations for auscultation and mobile electronic health. The Thinklabs ds32a is one of the leading electronic stethoscopes on the market today. PR: Hot on the heels of its popular PhotoTrader social photography application for iPhone, Tapestry today announces the immediate availability of Beautiful World for iPhone and iPod touch. It can be downloaded for free from the iTunes App Store. 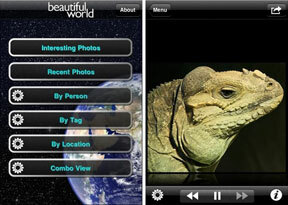 Beautiful World provides a clean, attractive, and exceptionally elegant slideshow interface to the popular Flickr photography service. With a single touch of a button, users can view a continuously updated feed of the most recent photos submitted to the service. Another option offers a selection of the service's most interesting - and, just as often, incredibly beautiful and inspiring - photos as selected by its users. Whether held in the palm of your hand or docked as an Internet-enabled photo frame, Beautiful World continues Tapestry's commitment to mixing art and technology in an exceedingly delightful, easy-to-use manner. In addition to the above features, optional enhancements to Beautiful World offer selective viewing of photos based on keyword tags, by creator or even the physical location photos were taken. Finally, a combo view option allows users to mix multiple photo feeds in a single display, offering hours of enjoying. "Whether held in the palm of your hand or docked as an Internet-enabled photo frame, Beautiful World continues Tapestry's commitment to mixing art and technology in an exceedingly delightful, easy-to-use manner," said Jeff Campbell, Tapestry's founder and lead developer. Founded in 2009, Tapestry's applications for the iPhone and iPod touch bridge the worlds of technology and artistry. ZDNet's Dan Kusnetzky says that Aqua Connect, a supplier of virtual access software for Mac OS X environment, is planning to offer a way for users of Apple's iPad to access applications and data found on Mac OS X-based systems, which could be important news for users of Apple's laptops, desktop and server systems. According to Aqua Connect, the Aqua Connect Terminal Server (ACTS) delivers the Macintosh OS X experience to PCs, thin clients, legacy Macs, and smartphones. Aqua Connect supports iPhone OS through various RDP and VNC clients. iPhone users have been able to use Aqua Connect Terminal Server in conjunction with RDP and VNC clients to remotely access OS X on their mobile devices. The iPad will receive similar functionality as Aqua Connect plans to support compatible RDP and VNC clients as they are released. "Apple has developed an innovative new product with the iPad and we are excited to offer access to OS X on the device through the Aqua Connect Terminal Server," said Lewis Larson, CEO of Aqua Connect. "Small and large corporations have already started planning on how to incorporate the iPad into their business and Mac terminal services on the device will open up a multitude of new possibilities. Aqua Connect also announced plans to support the iPad in their upcoming Mac Remote Desktop release. Aqua Connect's Mac Remote Desktop allows users to remotely connect to their Mac desktop through any compatible remote desktop client from Microsoft or other third party vendors. Aqua Connect's Mac Remote Desktop will allow a one to one connection to Mac hardware for remote access or administration purposes. In conjunction with Mac Remote Desktop, the iPad will allow users to access their Mac hardware remotely on a large display that they can take with them anywhere they go. The ability to achieve OS X on the iPad will make it a more effective part of the IT infrastructure in the enterprise, education and healthcare, said Lewis Larson. Our ultimate goal is to also make the iPad useful for consumers and those single users who want to access their Mac hardware at home or work. Aqua Connect will make it possible to deploy OS X to the iPad. The limitations of iPhone OS are transcended when the Aqua Connect Terminal Server or Mac Remote Desktop is deployed. Applications that are OS X dependent or require a greater amount of memory and processor speed can be deployed on the iPad through an Aqua Connect user session. The Remote Desktop Protocol (RDP) allows all of this to be done through fully encrypted and secure connections. With Aqua Connect, the iPad has the ability to run applications and software that are not available on iPhone OS. Aqua Connect Terminal Server 3.5 is available now with support for the Leopard and Snow Leopard platforms. Aqua Connect's Mac Remote Desktop is in the BETA phase and will launch later this year to the public. PR: DriveSavers, a leader in data recovery services, adds solid-state drive (SSD) failures to its popular iPhone application, DriveSaver. The free iPhone application is a hard drive simulator that educates users about hard drive data storage technology. A Flash-based web version of DriveSaver is available now. DriveSaver is fun, educational and useful to anyone who ever wanted to see inside a SSD or any hard drive and learn why drives fail. The most utilized feature of the iPhone application is "Crash a Hard Drive," a simulation of real-world drive failures that users experience daily. For the first time, the updated virtual environment simulates a SSD crash, allowing users to learn how these devices can fail. The application also simulates various types of other drive failures including watching a head crash score the platters and thus turning the data into dust. To learn more about DriveSavers and the DriveSaver application, visit drivesavers.com or call 800.440.1904. PR: Hunter Research and Technology announces the immediate worldwide availability of Theodolite 1.2 on the iTunes App Store. This novel multifunction augmented reality app for the iPhone serves as a compass, GPS, map, zoom camera, rangefinder, and two-axis inclinometer. Theodolite became the top selling navigation app in the US and UK App Stores in December 2009 after being featured by Apple in the New and Noteworthy category of the iTunes App Store, and broke into the Top 40 Paid Apps ranking in the US and Top 20 in the UK. Based on the concept of a centuries-old astronomical instrument, Theodolite overlays real-time information about position, altitude, bearing, range, and horizontal/vertical inclination on the iPhone's live camera image, turning the iPhone into a sophisticated location-aware viewfinder. Theodolite lets users take geo-stamped camera images directly from the app with 2X and 4X digital zoom options, and contains a built-in map with standard, satellite, and hybrid views. Uses are endless, from land surveying to basic navigation, and the app is great for hiking, boating, hunting, sightseeing, photography, and sports. Theodolite 1.2 continues the steady progression of features being added to the app. New features include multiple position formats including absolute and relative latitude/longitude coordinates and Military Grid Reference System (MGRS) coordinates. A calibrated optical rangefinder reticle has been added to the augmented reality display, allowing users to quickly estimate distance to objects and landmarks in view. This is backed up by a more precise mechanical rangefinder in Theodolite's A-B calculator, which uses the device's accelerometer to estimate range from changes in elevation angle. Theodolite 1.2 is $1.99 on the iTunes App Store. The app runs on any generation iPhone with OS 3.1 or later. GPS functionality requires an iPhone 3G or 3GS. Compass functionality requires an iPhone 3GS. More information, including screenshots, is available on the Hunter Research and Technology website. For every argument tossed forward by climate change skeptics, there's a body of scientific research that clarifies the issue. Thanks to an Australian solar physicist by the name of John Cook, you can access those skeptics' arguments, and the science-based counter-arguments, on your iPhone. The Version 1.0.1 of the Skeptical Science iPhone app provides the perfect solution for being able to just point at your phone the next time someone argues against climate change without a scientific leg to stand on. As Cook states in a blog post about the app, "This is a good idea for two reasons. Firstly, because now more than ever it's imperative that the climate debate focuses on science so the more readily available the science, the better. Secondly, well, an iPhone app is pretty cool." 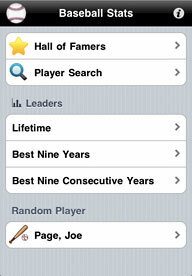 PR: Cash Productions has released its iPhone application Baseball Stats 1.0 in the AppStore. Baseball Stats is an iPhone application that delivers stats for Major League Baseball players in a rather different way. The application displays the statistics for a player's Best Nine Years in Hits, Home Runs, or some other category. It also displays the statistics for a player's Best Nine Consecutive Years span in any of the previously mentioned categories. Baseball Stats 1.0 is $4.99 and available exclusively through the App Store in the Sports category. Even though the iV gives you instant power on the go, the unique design allows you to directly insert it into an Apple dock to charge both your iPhone and the iV at the same time. Another great feature of the iV is the full size USB port that enables you to charge another device such as your Bluetooth headset, digital camera or even another iPhone. Ever try to find something in the dark with your cell phone as a light source? Well, if your cell phone wasn't bright enough, fear not, the iV comes packed with a bright built-in flash to help you during those tough situations. This bright LED light will give you the power to find anything in the dark without any problems. Besides acting as a flash light, it also doubles as a flash for photos as well. Now you can take pictures with your iPhone camera in low-lit areas. A feature that will surely make any camera-phone enthusiast thrilled. Made in the USAA quality product made in the USA ensures that your iV is constructed with care and precision. Our workers test each and every iV to the highest standards before they are shipped out. Not only is the iV backed with a 30 day guarantee, our trade-in program allows you to upgrade to future versions of iV so you'll always be powered no matter what iPhone you have. 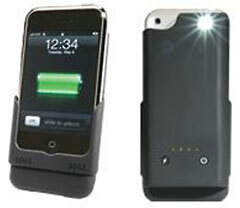 PR: This is a universal battery for iPod/iPhone. Update your iPod/iPhone/iPad at high speed with the latest music and data. 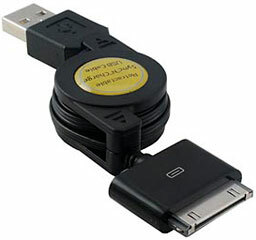 The iPod Dock Connector to USB Retractable Cable offers 400 Mbs throughput for quick transfer of your music and data to iPod/iPhone/iPad. 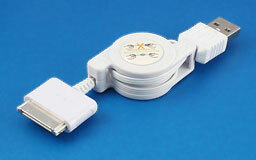 2-in-1 cable charge and transfer data simultaneously! The innovative retractable design cuts down on travel bulk and ensures the portability of your MP3 player without sacrificing functionality. No more tangled cable mess. Note: Cable is for Charging and Synchronization function only, iPhone/iPod/iPad is in docking mode when connected with this cable. PR: At home or on the road, don't be bothered by a clutter of cables. Our retractable cable eliminates the mess of cables that can accumulate on your desk or in your notebook bag. A unique ratcheting system adjusts the amount of visible cable at any given time. Whether you need a little or a lot, just pull the cable from both sides of the housing, and adjust it to fit your application. When you are finished, pull the cable again, and it retracts back into the housing, out of your way. PR: M-Edge Accessories, a leading provider of eReader accessories, will launch a suite of accessories designed specifically for Apple's iPad in Spring 2010. Designed to bring protection, innovation, and personalization to the iPad experience, M-Edge's offerings will allow users the freedom to take their device into any environment, from the office to the subway to the beach. "With the iPad, Apple is putting forth a compelling eReading platform, and we are excited to broaden our focus and develop accessories that will enhance the iPad experience," comments Patrick Mish, CEO at M-Edge Accessories. "Our laser-focus on eReader devices the past four years has offered M-Edge valuable customer insights and allowed us to achieve numerous product successes. I am confident that with this experience under our belt, we are positioned to bring fresh, novel, and industry-leading accessories to the iPad market." M-Edge will launch products from their already-established accessory lines in addition to new, iPad-specific products. M-Edge's FlexStand bookstand is certain to be a big hit for iPad users. The innovative bookstand is compact and portable, and uses flexible legs and adjustable feet to provide an adaptable, handsfree user experience. M-Edge's Professional Line of iPad jackets is designed for those looking for classic and stylish protection that is suitable for work environments. Available in up to 12 leather colors, the jackets in this comprehensive line are among M-Edge's bestsellers. The Executive Jacket includes a fashionable and smart wraparound closure strap and utilizes a four point mounting system for exceptional device security. The Platform Jacket employs an easel-style design that allows for handsfree usability. The Page Sleeve is a lightweight sleeve to house your iPad while not in use, and includes a top closure strap for superior device security. The Destination Bag is a compact travel bag that contains two roomy compartments for storage of your iPad, chargers, and personal items. The M-Edge Sport Line provides the perfect solution for adventurous and rugged iPad users who do not want to worry about wear and tear, dirt, sand and screen scratches while on-the-go. Each is available in six bright colors: red, orange, yellow, lime green, navy blue, and black. The Leisure Jacket utilizes a clear vinyl cover that will protect the iPad's screen while still allowing full touchscreen functionality. The Latitude Jacket zips closed for outstanding protection and includes extra zipper pockets for storage of other accessories. 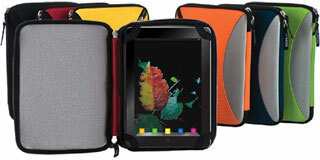 The Touring Sleeve is made of impact-resistant neoprene and will safeguard the iPad against drops. The Journey Bag is a messenger-style bag perfectly sized to accommodate iPad and all its accouterments during everyday travel. The Contemporary Line is aimed at readers who want their iPad accessories to make a statement with a modern, bright look. Each Contemporary product is constructed of durable canvas with leather trim and a cream-colored microsuede interior, which allows for safe device travel while providing an urban feel. All Contemporary items are available in six colors: magenta, apple green, yellow, navy blue, orange, and black. The Trip Jacket opens like a book and uses a contrast-colored elastic strap for secure closure. 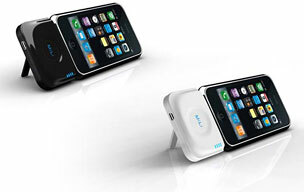 The Flip Jacket flips open vertically and utilizes a four-point mounting system to secure the device. 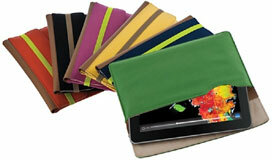 The Slip Sleeve keeps the iPad fashionably tucked away while not in use. The Hip Bag is a compact, messenger-style bag with easily accessible pockets for storage of accessories and other personal items. All M-Edge iPad accessories will be available for purchase in Spring 2010. PR: The PED3-U universal stand holder works with any bare device or a device with a case or skin like the iPhone, iPod, Blackberry, Droid, Palm, Motorola, Smartphones and more. In portrait view or landscape the PED3-U is a fast and simple stand with protected over cupped holding fingers to accommodate any device while keeping it securely in the stand. Like no other stand, the heavy stable platform shape is made from one solid piece of steel in the USA. Keeping your cable where it belongs can be frustrating and this important, that is why we used our Thought Out exclusive split back cable management design. PR: To protect you against any nasties you could pick up from your mobile, Proporta has developed a range of Antimicrobial Silicone Cases - and a new report from the good people at SteriTouch, used in the cases, has shown just how effective the Proporta products are. SteriTouch performance againt E Coli and MRSA. It's an alarming, but not entirely surprising fact that the filthiest things we encounter on a daily basis are our computer keyboards and our mobile phones. In fact, the average mobile has 25,127 germs per square inch whilst the average toilet seat has just 49. Nice. To protect you against any nasties you could pick up from your mobile, Proporta has developed a range of Antimicrobial Silicone Cases - and a new report from the good people at SteriTouch, used in the cases, has shown just how effective the Proporta products are. In fact, tests on the cases showed a 99.99% reduction of MRSA and e. coli after 24 hours, which is as close as you can get to just about perfect. As you can see from the graphs, when you compare the Antimicrobial Case sample with the control, the difference is genuinely remarkable. So if you want to use your mobile in the safe and secure knowledge that it's not harbouring an invading germ army, then look no further. These Antimicrobial Silicone Cases not only look after your device and keep it safe from scratches, dirt and impact damage, they look after your health into the bargain. And that's a good deal no matter which way you look at it. P.S. Check out the Proporta Puzzle, earn yourself 20% off Proporta products, and have some fun at the same time. PR: TuneWear announced that it is now shipping the new wallet case series TuneWallet for iPod touch. TuneWallet for iPod touch is a chic and stylish protective case with colorful elastic band and card holder slots. TuneWallet for iPod touch is a wallet-style case accented with a colorful elastic band. iPod touch tucks securely inside and there are two card holder slots for your credit card, driver's license, IC card or cash. Undo the elastic band and flip it open to access iPod or take out a card. The quick release hole in the card holder slot helps you to take out the card you use most often. When you are done, close TuneWallet back up and keep it tucked away in your bag or pocket. The elastic band will keep it from popping open and the TuneWallet cover will protect iPod touch from getting scratched by loose items in your bag or pocket. TuneWallet for iPod touch is available in three colors: Orange, Pink and Green. The dock connector can be accessed without the need to remove iPod touch from TuneWallet. TuneFilm protective film for the iPod screen is included. 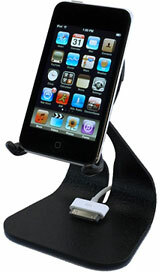 TuneWallet for iPod touch ($24.95) is now shipping and is available for purchase at the TuneWear online store. 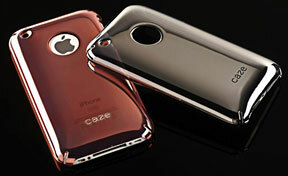 PR: Caze announces their Jade Shine Swarovski case, a premium version of its Jade Shine See-Thru for iPhone 3G and 3GS. JADE Shine is the world's first Anti-Interference See-Thru iPhone case which is available in 4 fashionable colors: Green, Silver, Purple and Rose Gold. It has an ultra-thin wall thickness and plated with an Anti-Interference translucent coating. The premium versions add more than 50 Swarovski crystals around the logo hole of the case. Caze is creating new case styles by mixing colors and crystals. The Jade Shine See-Thru is characterized by Anti-Signal Interference feature and Shinny color effects. In this new versions, Caze adorned JADE Shine with high quality Swarovski Crystals around the logo hole. The Free Swarovski Crystal Apple logo features more than 40 crystals and is visible through the hole in the case for a classy look. The Premium versions do not only add personal chic but also protect all corners of your iPhone, including the chrome edges. A Bright, Shiny, Durable metallic case combining with the Free Swarovski Apple logo will give extra sparkle and shining effects to your iPhone. 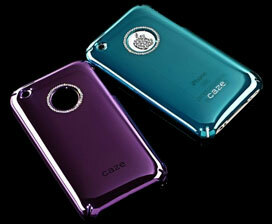 If you wish to choose a shiny metallic case that won't block your phone signal, try out Caze's Jade series. Customers who buy JADE Shine Premium from Caze will get a Mirror Screen Protector, an Anti-FingerPrint Screen Protector, a Microfiber Cleaning Pouch and a Swarovski Apple Logo for free.